Yesterday Canada’s The Score reported that Chael Sonnen has “started the process to file an appeal with Keith Kizer and the Nevada Athletic Commission” arguing that the Anderson Silva knee that led to Sonnen’s defeat was intended to be an illegal strike. They further argue that Silva’s thigh struck Sonnen’s face (although it is worth noting that while knee strikes to grounded opponents are prohibited, there is no prohibition to a thigh grazing the face of a grounded opponent). Leaving aside the incredible uphill battle of arguing that the most accurate striker in the history of MMA intended the blow to land elsewhere, this made me wonder whether there is any actual prohibition to ‘intended’ illegal strikes. Review of the Unified Rules of MMA show no such prohibition. 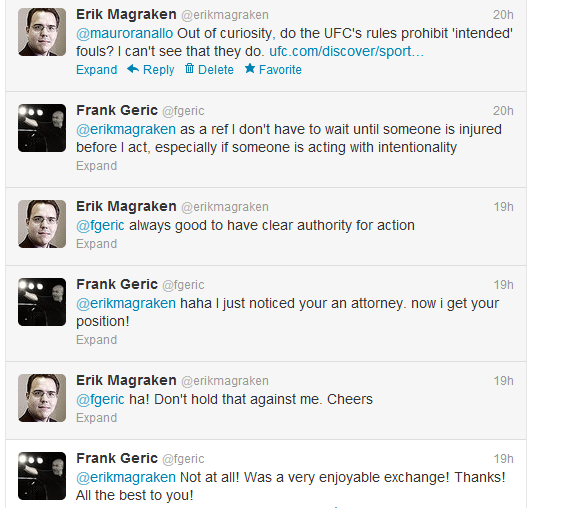 I posted this observation on Twitter which led to the following exchange of ideas with Frank Geric who is an MMA ref in Cleveland Ohio. Frank Geric went on to note that the prohibition of Unsportsmanlike Conduct likely creates enough latitude to cover intended fouls. This makes sense but there is something desirable about specificity of prohibited conduct. Since BC needs to adopt Rules in the very near future under the Athletic Commissioner Act, and since the Unified Rules of MMA are the most obvious choice I suggest it makes sense to add a brief section specifically addressing ‘intended’ fouls to give combatants certainty as to the prohibition of intended fouls and further to give regulators/referees specific authority and confidence in their ability to intervene with such conduct.